In honor of this being John Moses Browning’s birthday weekend, I wanted to write about what I think is his least appreciated design. I’ll even go so far as to say it might be his biggest achievement. It is also the gun that brought about his split from Winchester and sent him across the ocean to FN, starting that productive relationship. Yes, it was pretty important in a few ways. That is the gun that is usually known as the Browning Auto-5 shotgun. Almost as soon as the first self-loading rifle was invented around 1890, people were trying to develop a semiauto shotgun. If a quick repeat shot was desirable in a rifle, it definitely would be desirable in a shotgun when the birds are flushing. Designing one that worked was a big challenge. The big problem was shells. The shells of the day were as inconsistent as you could imagine, and it got worse as smokeless powder joined black powder. Some people had doubts about the new smokeless, so black powder was loaded for years to come. The smokeless powders were refined along the way, with new powders coming out often. It might be common to find shells on a store shelf loaded with a different powder type in every box. The shells could be paper, brass, paper with a steel head, etc. Brass dented and otherwise got mishaped. Paper drew and held moisture, swelling them and cracking the metal heads. Wads varied. Unlike today when shotcups are carefully designed to protect the shot from chamber to muzzle, the old wads were hardly more than fillers. They could be made of almost any material from cardboard to cork to pressed sawdust or horsehair. Shot charge weights could be anything. The shell mouths might have been star crimped, but more likely rolled over an overshot wad, which was usually card but not necessarily. I have a reprint of an 1898 Winchester catalog handy right now, and they list six or eight lines of shells, with numerous variations within each line. I won’t even try to count how many they had, and that’s just one company. There were a lot of ammo companies at that time, as the big fish had not taken over all the little fish yet. With the various shells out there, how on earth could you make a shotgun whose action was powered by those shells? A lot of people tried. John Browning really wanted to get it done. What many people don’t know is that John Browning was quite an accomplished shotgunner. In addition to wingshooting whenever he could, he was part of a live-bird trap team known as “The Four Bs” (John Browning, Matt Browning, G. L. Becker, and A. P. Bigelow) that did well in the live-bird trap events held in and around Utah. When he designed the pump action shotgun that became the Winchester 1893 then 1897, he was talking from experience when he said it’s operation came naturally when swinging on a bird. But even for the master, it took a long time before the solution came. It came nearly ten years after he designed the pump gun and 20 years after his first automatic rifle experiments. In the time since the pump shotgun, he had done most of his Winchester designs. And he still had not solved the problem of how to make an auto shotgun. That auto shotgun had to be on his mind. Gas operation was pretty much out due to the wide variation in pressures the shells generated. It would have to be recoil-operated. The breechblock and barrel would recoil together briefly before they unlocked to allow the breechblock to continue rearward. But how to regulate it? The solution was so simple it’s almost silly. He came up with what we call the friction ring, and he called a shock absorber. As the barrel came back, it was “braked” to a consistent speed by this ring. The ring was a bronze collar that slipped over the magazine tube. I was split so it could be squeezed down around the tube. It’s forward end was beveled on the outside. 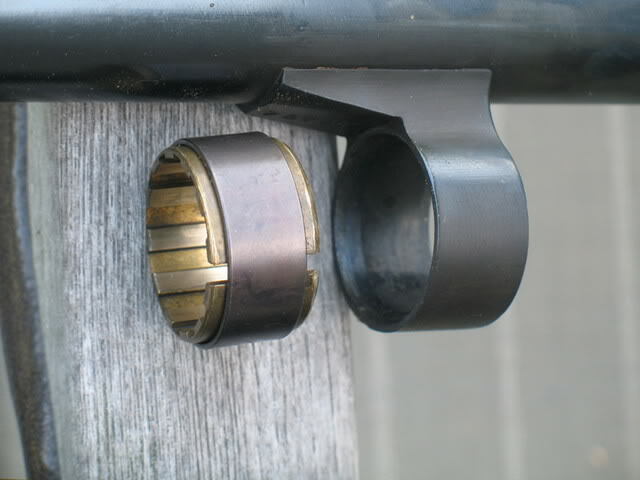 The barrel also had a ring that slipped over the magazine tube, with a bevel on it’s rear side but on the inside edge. The barrel ring’s bevel would seat against the friction ring’s bevel when the gun was assembled. 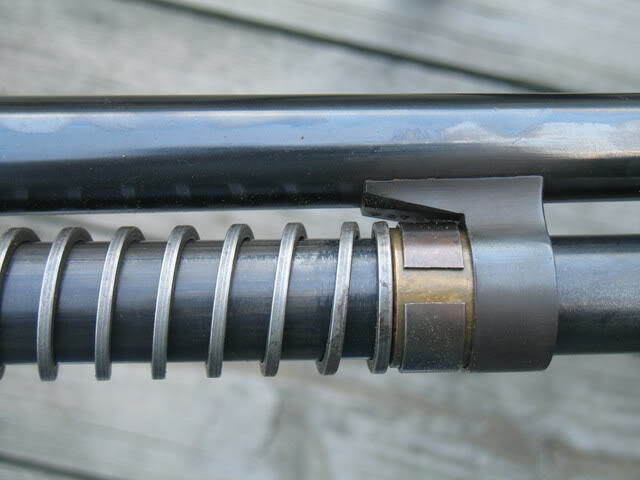 When fired, the barrel came back and it’s bevel squeezed the friction ring down around the magazine tube. The harder the barrel came back, the harder that friction ring grabbed the mag tube. It worked. It didn’t depend on what the shell was made from, only how it recoiled. I doubt it worked with every single shell made then, but it surely covered to bulk of them. At the time, the magic device that made it work- the friction ring- could be made for a dime each. John Browning knew he had gold. Unlike other designs that were better ways of doing something, this was new. There had been no semiauto shotgun before. He tested it more than any design he tested before, building two models that were slightly different and shooting them in the field and in competitions around Ogden, Utah here he let other competitors try them. He took it to Winchester’s T. G. Bennett in April of 1899. As the story usually goes, Browning asked for royalties instead of direct payment, Bennett refused, and Browning headed to Belgium. That is a good summary, but there was more to it than that. The usual practice for John Browning’s new guns went like this: He would take his prototype(s) to meet with Bennett, and if he expressed interest in the design he would leave it at the Winchester factory. Winchester’s engineers would look the design over, and their attorneys would file any required patents in Browning’s name. This allowed Winchester to keep the gun out of sight while they considered it’s merits, and saved Browning the trouble of messing with patent attorneys. This usually took a matter of weeks, perhaps a couple of months. Over a year later, the auto shotgun was still at Winchester, with little progress made toward them buying the design. There had been correspondence about finding existing patents covering small parts, but Browning had altered them accordingly. Still, the gun sat. Bennett and Winchester were conservative about changes. They were nervous of innovation, and probably had reservations about the shotgun’s lack of an external hammer. So they dragged their feet for over two years. Browning had enough one day and suddenly decided to head to New Haven, CT. He wanted a decision on the gun. By now, he was working on a royalty basis with other gun companies. Knowing he had a winner with the auto shotgun, he asked the same from Winchester. Bennett flat refused, stating it was against company policy (no matter who you were). Browning went out to the drafting room where his two models were, picked them up, and left with the guns…the guns Winchester had patented in his name. And that was the end of Browning and Winchester. He contacted Remington, and told their president Marcellus Hartley he had something to show him and could he come over. Can you imagine being the head of a gun company, and John Browning calls you up asking for a meeting because he has something to show you? You bet you can come over, Mr Browning sir! He told him to come over that afternoon. Browning was met by some happy people at Remington, who told him to have a seat and the president would be right with him. An hour later, Browning was still waiting and getting irritated. Hartley’s secretary came out and informed Browning he had a heart attack and died. I can imagine why. This was January 1902. Browning soon left for Belgium. FN had been making some of his automatic pistol designs and he would see if they were interested. They were, and would make the Auto-5 for the next 97 years. Remington would get to make the gun starting in 1905. They called it the Model 11 after 1911. 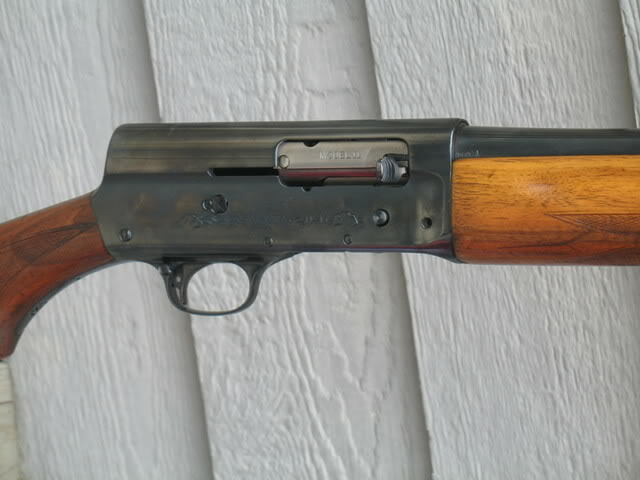 Savage would make it as the Model 720 from 1930-1949. Remington made the M11 until their 11-48 came out in 1948 or 1949. The 11-48 was essentially a modified Model 11 with a streamlined receiver. It wasn’t until their gas operated Model 58 came out in 1956 that Remington had a non-Browning-designed semiauto shotgun. The J.C. Higgins model 60 (made by High Standard) came out before that, but the Remington 58 was the first really successful semiauto shotgun since the Auto 5 began production in 1902. There were attempts, but none lasted long or sold very well. That’s 54 years of the A-5 not only being king of the hill, but practically having the hill to itself. John Browning had been dead for nearly 30 years before there was a serious competitor, and the gun could have entered production before it did..
Part of that is due to the patent protections Winchester put on the gun they never made, but part of it was from everybody else still not able to design a good semiauto shotgun. The patents had expired before there was a challenger. Even with the improvements in shotgun shells over the decades, an auto shotgun was still a feat to make then. There are other lever action rifles, other machineguns, and the 1911 pistol had some competition. But the Auto-5 stood alone for a long time.